The Mule is a 2018 Crime Drama Thriller movie directed by . It stars Clint Eastwood, Bradley Cooper, Laurence Fishburne, among others. The Mule is currently rated 6.4 stars on the ReelBugs scale. You sure you want to delete this post? 88 years old and still a boss! Clint Eastwood is incredible. Even as an old man he still has his classic badass swagger. No one can replace Clint Eastwood. It will truly be a sad day when he is gone. 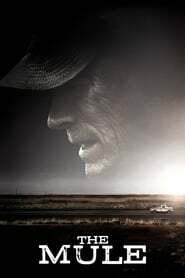 Many critics might come forward for Clint Eastwood doing such a movie as this and although I have always been a fan of Eastwood, in truth within this movie...I can relate to it. After being forced into retirement at age 63 because after being laid off, no one would hire me because of my age and so I took and early retirement....And that was hard! My wife was on a disability from a bungled back surgery leaving her in excruciating pain thereof. She became addicted to pain pills so we remained together for 22 years with her addiction problem that eventually ruined the marriage. Lucky we had no children. But a little over four years ago, she unknowingly left me when I went to visit my family over the weekend. She took a majority of our retirement fund which wasn't much, and many other things that left me with bills and a mortgage that I was barely able to pay because of my meager Social Security. I was nearly in foreclosure on my home, losing her income and with no senior housing or apartment living available, I was looking at living on the streets in my old age. I am now 70 years old, she passed away last February from ALS and I am still struggling financially trying to remain in my home. And I will tell you this....when this came upon me this sudden, I was scared out of my mind, dealing with depression, anxiety and you name it that I was near suicidal that I ended up in a mental hospital for a time. You never know what a person will do when his livelihood is threatened, you are about to lose everything life offered you in your younger days and now you are old, alone and lonely without a rational way of viewing life. A person gets desperate in times like this because all you have on your mind is how to survive. I suppose if an opportunity came along to run drugs at the time I was in this desperate and depressed state....I could have very easily done the same thing as this character Clint Eastwood played. I was frightened and desperate more-so than I was ever before in my life!! The only thing I had to get me through was my mother passed on just before she left, but she owned a few acres of wheat land she inherited but could not be sold as it was still on a two year lease. Once the lease was over my family sold this acreage.....That is the only thing I had to help me through this crises. If that would have not been the case....I was very close to ending it all....So, when old age hits hard and you are about to lose it all....a person can get so desperate it is no telling what he is capable of doing!! Have you ever noticed that there is only 3 cattagories of movies thease days. Movies that are obviously remakes from the 7o's or 8o's., comic book heros or villians., and last but best clint eastwood movies. Some became actors, some were born actors. ... Clint Eastwood . Even Chuck Norris stays off his lawn. Love how Clint mocks, and makes fun of the toxic social media loser environment in this film ! His idol in life was Clint Eastwood. Those words along with the piano is heaven like. Now this is a movie I'll go pay to see. Anything with Clint Eastwood is a must see. There will never be another Clint Eastwood. Considering he's almost 89, he looks great. Unlike De Niro. Eastwood makes films, as he gets older, that are pretty good. There is just no quit in you Eastwood !! Your acting and directing are impeccable !!! Love you!!!!!! #2 at the box office this last weekend I think it just opened. The man is amazing and the last great director/actor of the real america. God Bless Clint. What a good movie! I'm amazed how he's still doing it! Clint Eastwood legend! I see Mr. Eastwood - I press like. He is a living legend, Im so happy to have another movie with him in it! Much love to Mr. Eastwood! A good actor, A good director, A good actor again !!! Your life is a Beautiful karma just by the movies! We're sure in your personal life too! Cheers old man !! Get three coffins ready... ...You see, that's what I wanna talk to you about. He's feeling real bad... ...My mule. You see, he got all riled up when you went and fired those shots at his feet... ...Unh, unh, no. You see, I understand you men were just playin' around but, the mule, he just doesn't get it. Of course, if you were to apologize... ...I don't think it's nice, you laughin'. You see, my mule don't like people laughin'. He gets the crazy idea you're laughin' at him. Now, if you'll apologize, like I know you're going to, I might convince him that you really didn't mean it... ...Who are you?... ...Yeah, well, if you're the Sheriff you better get these men in the ground... ...My mistake, four coffins. From this riveting trailer, looks like Clint is gonna MAKE OUR DAY at the theater once again! (And from how he looks, perhaps for the last time.) God bless Clint Eastwood! I wonder what drives men like Clint Eastwood and Martin Scorsese to make movies at such an age. I'll be damned if I even live upto 50. Subscribe For Free Movie Tickets!